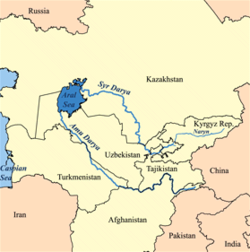 The Amu Darya (Persian: آمودریا‎, Āmūdaryā; Arabic: جيحون‎, Jihôn or Jayhoun; Hebrew: גּוֹזָן‎, Gozan ), also called Oxus and Amu River, is a major river in Central Asia. It is formed by the junction of the Vakhsh and Panj. In ancient times, the river was regarded as the boundary between Iran and Tūrān. In antiquity, the river was known as Vaksu to Indo-Aryans. In ancient Afghanistan, the river was also called Gozan, descriptions of which can be found in the book "The Kingdom of Afghanistan: a historical sketch By George Passman Tate". In classical antiquity, the river was known as the Ōxus in Latin and Ὦξος Oxos in Greek. The name Amu is said to have come from the medieval city of Āmul, (later, Chahar Joy/Charjunow, and now known as Türkmenabat), in modern Turkmenistan. Darya is the Persian word for "river". Amu Darya is a river almost in reverse. It gets its water from a powerful glacier fed stream high in the Pamir Knot at the eastern end of Afghanistan's Wakhan Corridor, and does not end at the sea but spreads out into the sands of Turkmenistan's Kyzyl Kum desert instead of the inland Aral Sea as it did in former times. In the traditions of the Islamic prophet Muhammad (hadith), the river is called by the name Jayhan (Arabic form of its ancient name Gozan). "Four rivers gush forth from Paradise: the Euphrates, the Nile, the Sayhan, and the Jayhan"
Historians tell us that one of the most ancient names for the Oxus or Amu in ancient Afghanistan was Jayhan. A name used by Greek, Mongol, Chinese, Persian, Jewish and Afghanastan historians. .
"Hara (Bokhara) and to the river of Jayhan (that is to say, the Amu, (called by Europeans the Oxus)....". "the Jayhan River is the River Balkh, i.e. the Oxus or the Amu Darya.....". "... and were brought into Halah (modern day Balkh), and Habor (which is Pesh Habor or Peshawar), and Hara (which is Herat), and to the river Gozan (which is the Ammoo, also called Jehoon)...". The river's total length is 2,400 kilometres (1,500 mi) and its drainage basin totals 534,739 square kilometres (206,464 sq mi) in area. The river is navigable for over 1,450 kilometres (900 mi). All of the water comes from the high mountains in the south where annual precipitation can be over 1,000 mm (39 in). Even before large-scale irrigation began, high summer evaporation meant that not all of this discharge reached the Aral Sea - though there is some evidence the large Pamir glaciers provided enough melt water for the Aral to overflow during the 13th and 14th centuries A.D. Historical records state that in different periods, the river flowed into the Aral Sea (from the south), the Caspian Sea (from the east) or both, similar to the Syr Darya (Jaxartes, in Ancient Greek). About 1,385,045 square kilometres (534,769 sq mi) of land is drained by the Amu Darya into the Aral Sea endorheic basin. This includes most of Tajikistan, the southwest corner of Kyrgyzstan, the northeast corner of Afghanistan, a long narrow portion of western Turkmenistan and about half of Uzbekistan. About 61% of the drainage lies within Tajikistan, Uzbekistan and Turkmenistan, while 39% is in Afghanistan. Of the area drained by the Amu Darya, only about 200,000 square kilometres (77,000 sq mi) actively contribute water to the river. This is because many of the river's major tributaries (especially the Zeravshan River) have been diverted, and much of the river's drainage is dominated by outlying desert and steppe. The abundant water flowing in the Amu Darya almost entirely comes from glaciers in the Pamir Mountains and Tian Shan, which, standing above the surrounding arid plain, collect atmospheric moisture which otherwise would probably have escaped somewhere else. Without its mountain water sources, the Amu Darya would not contain any water because it rarely rains in the lowlands that characterize most of the river. Throughout most of the steppe, the annual rainfall is about 300 millimetres (12 in). was called the Oxus by the ancient Greeks. In ancient times, the river Jayhan was regarded as the boundary between Irān and Tūrān. The river Jayhan drainage lies in the area between the former empires of Genghis Khan and Alexander the Great, although they occurred at much different times. One southern route of the Silk Road ran along part of the Jayhan river northwestward from Termez before going westwards to the Caspian Sea. It is believed that the Amu Darya's course across the Kara-Kum Desert has gone through several major shifts in the past few thousand years. Much of the time, the most recent period being in the 13th century to the late 16th century, the Amu Darya emptied into both the Aral and the Caspian Seas. Sometimes, the flow through the two branches was more or less equal, but often, most of the Amu Darya's flow split to the west and flowed into the Caspian. People began to settle along the lower Amu Darya and the Uzboy in the 5th century A.D., establishing a thriving chain of agricultural lands, towns, and cities. The first British explorer who reached the region was a naval officer called John Wood. He was sent on an expedition to find the source of the river in 1839. He found modern day Lake Zorkul, called it Lake Victoria and proclaimed he had found the source. Then, the French explorer and geographer Thibaut Viné collected a lot of informations about this area during five expeditions between 1856 and 1862. The Oxus river, and Arnold's poem, provide a literary background for the 1930s children's book The Far-Distant Oxus. ↑ "Basin Water Organization "Amudarya"". Interstate Commission for Water Coordination of Central Asia. Retrieved 2010-02-11. ↑ "Amudarya River Basin Morphology". Central Asia Water Information. Retrieved 2010-02-09. ↑ Pavlovskaya, L.P. "Fishery in the Lower Amu Darya Under the Impact of Irrigated Agriculture". Karakalpak Branch. Academy of Sciences of Uzbekistan. Retrieved 2010-02-09.